Our second Captain Marvel shows us Carol in her Starforce uniform - and unlike Funko POP!s, the Minimates have the good sense to just call her "Starforce Captain Marvel" and not "Vers." Which, yes, just means that the Kree think her proper name is "Dann-Vers," but (as our reader Nola pointed out) "vers" is a slang term that says a lot more about Carol than it's probably intended to. Not necessarily wrong, mind you, but we're not here to judge. Also, don't try looking it up at school or work. 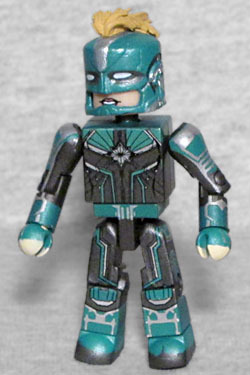 Anyway, this Minimate is pretty much the same as the other one, just done in teal and silver rather than red and blue. She comes with the same hair, the same helmet/mohawk piece, and the same swoosh stand, but her tampoed expression is different: her eyebrows are angrier and she's showing her teeth. Hey, it's Korath! From Guardians of the Galaxy! Apparently he was doing stuff before he got his job as a Pursuer. 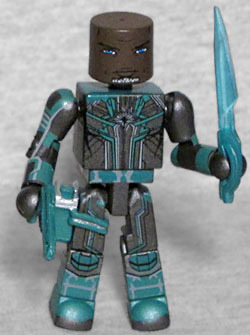 In the comics, there are blue-skinned Kree and pink-skinned Kree, but apparently the movie is adding brown-skinned Kree, because Korath is played by Digimon Houston, a man with a name so outlandish that if you put the words "Digimon Houston" into Google, the search results automatically default to Djimon Hounsou's IMDB page. He's bald and has a little silver goatee, and wears the team's standard green uniform. Still beats the comics, where he looked like a giant lobster. This figure gets a gun to fit in the holster on his right leg, and two swords with translucent blue blades.